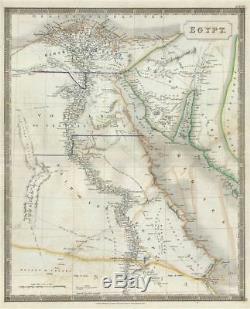 1835 Hall Map of Egypt. WE SELL ONLY ORIGINAL ANTIQUE MAPS - NOT REPRODUCTIONS JOIN OUR WEEKLY MAILING LIST FOR NEWEST STOCK. Description: This is a beautiful map of Egypt from Sidney Hall's extremely scarce 1835 New General Atlas. It depicts Egypt, centered on the Nile River from its delta on the Mediterranean south as far as the Desert of Chebba and the Port of Abyssinia and from El-Wah or Great Oases east as far as Naaman Islands. Egypt is here divided in to Mamluk provinces of Bahari (Lower Egypt), Vostani (Middle Egypt), and Said (Lower Egypt). Hall's map notes numerous cities and villages along the river as well as various ancient Egyptian ruins including the Pyramids of Giza and the'Sepulchers of the Kings of Thebes' (Valley of the Dead). It also offers considerable detail regarding the Valley of the Lakes of Natron with is numerous important Egyptian Coptic monasteries. Various battles between the Ottoman and French forces under Napoleon are noted, including El Arish 1799, Ghizeh 1798, and Aboukir 1798, among others. Near Suez, Hall identifies the Ancient Canal which would soon give way to a more modern variant. Numerous caravan routes are mapped throughout and ancient place names are written in parentheses. Hall prepared that map in the declining days of the Ottoman Empire. In Egypt, following the expulsion of the Napoleonic forces by the Ottoman Mamluk Turks, Muhammad Ali, the Ottoman viceroy of Egypt, established the Mamluk dynasty that would rule Egypt until the Egyptian Revolution of 1952. Between 1820 and 1833, Ali annexed northern Sudan, Syria and parts of Arabia into the Mamluk Empire. Sidney Hall's New General Atlas was published from 1830 to 1857, the first edition being the most common, with all subsequent editions appearing only rarely. Most of the maps included in the first edition of this atlas were drawn between 1827 and 1828 and are most likely steel plate engravings, making it among the first cartographic work to employ this technique. Each of the maps in this large and impressive atlas feature elegant engraving and an elaborate keyboard style border. Though this is hardly the first map to employ this type of border, it is possibly the earliest to use it on such a large scale. Both the choice to use steel plate engraving and the addition of the attractive keyboard boarder are evolutions of anti-forgery efforts. Copper plates, which were commonly used for printing bank notes in the early 19th century, proved largely unsuitable due to their overall fragility and the ease with which they could be duplicated. The American inventors Jacob Perkins and Asa Spencer responded to the call. Perkins discovered a process for economically softening and engraving steel plates while Spencer invented an engraving lathe capable of producing complex patters repetitively - such as this keyboard border. Though Perkins and Spenser did not win the prize, their steel plate engraving technique was quickly adopted by map publishers in England, who immediately recognized its value. Among early steel plate cartographic productions, this atlas, published in 1830 by Longman Rees, Orme, Brown & Green stands out as perhaps the finest. This map was issued by Sidney Hall and published by Longman Rees, Orme, Brown & Green of Paternoster Row, London, in the 1835 edition of the Sidney Hall New General Atlas. Size: Printed area measures 21 inches high by 17 inches wide. Minor wear along original centerfold. If your address is a P. DHL International EXPRESS (45 USD). Antique Map Restoration Services: Geographicus can repair and restore your antique map. Services include deacidification cleaning flattening and backing. The item "1835 Hall Map of Egypt" is in sale since Thursday, September 20, 2018.